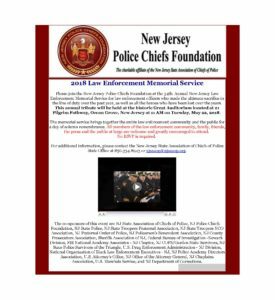 Please join the New Jersey Police Chiefs Foundation at the 34th Annual New Jersey Law Enforcement Memorial Service for law enforcement officers who made the ultimate sacrifice in the line of duty over the past year, as well as all the heroes who have been lost over the years. This annual tribute will be held at the historic Great Auditorium located at 21 Pilgrim Pathway, Ocean Grove, New Jersey at 11 AM on Tuesday, May 22, 2018. The memorial service brings together the entire law enforcement community and the public for a day of solemn remembrance. All members of the law enforcement community, family, friends, the press and the public at large are welcome and greatly encouraged to attend. For additional information, please contact the New Jersey State Association of Chiefs of Police State Office at 856.334.8943 or njsacop@njsacop.org.